Each week a photo is posted as a prompt to write a story in around 200 words. 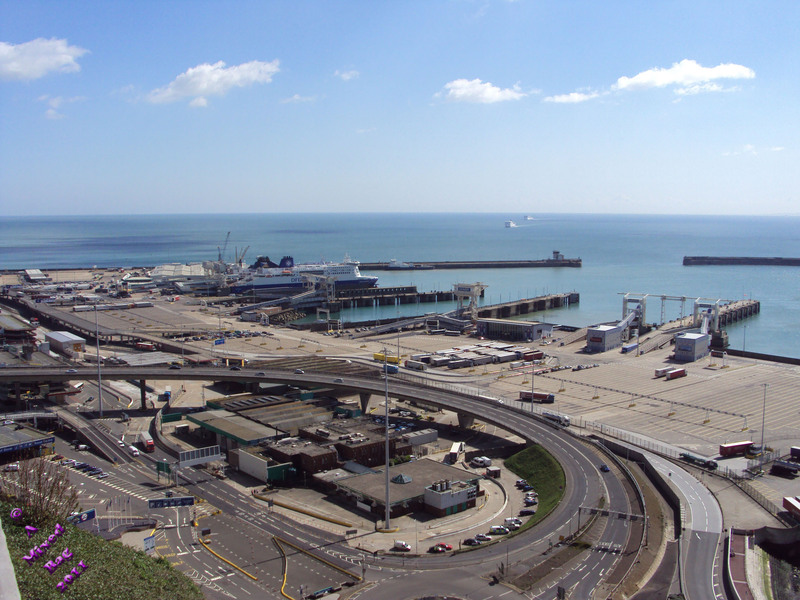 My story has an element of truth to it, in that there are very often racist marches on the docks here in Dover. Last week there was a march that turned violent with racists clashing with non racists. If you want to have a go then follow this link, and if you want to read what others have written, then follow this link. He stood at the docks with his placard adorned with racist words. He didn’t want this filthy scum in his country. HIS country was for white people. For the people who lived here, who always lived here. More and more of his friends gave in and walked away a long time ago. Him being one of the last to come every week in the hope someone would listen and deport all these vile creatures so HIS country could be strong again and not diluted. One of the other demonstrators asked him for a cigarette, and he told him no, in a more abrasive fashion, and looked away. He didn’t see the knife, but he felt it, straight between the ribs. He looked at his attacker, as the latter rifled his pockets and took his last smoke. People ran, screaming. Two ran toward him. He thought he must be hallucinating as they seemed to be talking gibberish. He felt himself being slid onto his placard and the dark face yelled something, and he felt tugging on his side. It is unfortunate that even when saved by someone of a different race, some racists will still feel the need for hate. Underneath the colour of the skin, the tone of the voice, or the language, then everybody is the same. Looks at someone as only muscle, or only skeleton, and you won’t know what colour or sexual orientation they are. Racism and all other hatred upsets me, and I hope that one day it will become an insignificant problem. I know it will never go away completely, because there will always be haters. Please don’t take this story as being racist, because I am not. Far from it. I have friends of differing religions, faiths, beliefs, creeds, colours, sexual orientation and altered genders. This entry was posted in Fiction and tagged February 2016, Flash fiction, Online Writing, Photo Fiction, Short Stories, Short story, Sunday Photo Fiction. Bookmark the permalink. I watched a show a few years back on the History channel about the first ‘Eve’ not the Biblical Eve. And it was thought that this woman ‘Eve’ had come from Africa. It didn’t matter the reasons for migration, the standard, better living, weather, food. There was a test done on hundreds of different people in either New York city or perhaps many places that at least 80% of the worlds population no matter what there heritage had DNA from this ‘first’ woman and her children. So it is very true about us all being the same. And that differences are really only a matter of opinion. It is also true that the media likes to blow things out of proportion and not get all the facts. News reporting is now more entertainment and rarely can be depended upon – in my opinion. Your story rings true as there are some today who breath who still think just like your character. Hopefully our children and the younger people of today can see through all the smoke and mirrors and find peaceful truth. As far as my kids are concerned, colour is just a pigment. It reflects nothing on the person under the skin. Their actions do that. I like this Eve. It’s spot on I think. Too bad this story is closer to the truth than fiction. A good reminder, though. It is unfortunate. He seems to have missed the point (no pun intended) that it was one if his own that committed a crime against him, and one he hates that saved him. [ Smiles ] A fabulous piece on the topic of racism! Thanks very much Renard. Racism is a hate crime I wish never existed. Along with every other hate crime. This is a great story glad I got to read it. Before I was living here then. I was originally a few miles over in the next town, then I moved 300 miles away for a little while, and then moved here. It was like I travelled 7 miles via the north. Wasn’t there a movie about the Korean war where an American soldier wanted to die rather than be given a transfusion from an African American… or was that MASH? I’m not sure. I never watched MASH, but it wouldn’t surprise me. You have a brave heart. I breathed you story. Thank you. Thank you so much. A well written story. It shows that when you know the subject it comes out much clearer. It is unfortunate that I know a couple of people who are members of the English Defence League (EDL) and Britain First. It is so unfair when people react like that when they are in situations that they need to work together. Maybe we should start our kids singing songs like this in schools again. I agree with you. From a young age some children are forced by their parents to hate others. That is why I like the idea of letting young children sing at school and act out good things. I immediately interpreted the story as a critique of racism, not as you being racist. Well written, really capturing the way that some people do, tragically, think and talk and act. Thank you Joy. Some people are just so racist that they cannot see any other way. If we were to look back over their family history, we would probably find a whole line of racists and worse. Great story. Sad he can’t see beyond his racist views. even when an Indian doctor saves him. Thanks Mandi. It is sad. Especially when the doctor would have known his feelings due to the placard. He didn’t have to help. I think the Doctor did the right thing. Hate perpetuates hate. So you have to try to stop the cycle even if the other person doesn’t understand why. The fact that it was one of the people who were of the same group as him that caused the injury, should have shown him that colour is only skin deep. You have written a very scary story deep rooted in reality. It is such a shame that people think that way, but they do. It is unfortunate that I know a couple of people like these. They would rather send anyone not indigenous to this country back across the sea or the borders. Which is unfortunate considering very few people on this planet can trace their ancestry back to the country they currently reside in. This is very true, as we are all probably immigrants at one point in the past. Some people are so full of hate they have no room for reasoning. Unfortunately, some of these people are taught this from childhood. It is. My daughter realised only a couple of months ago that one of her friends from primary school wasn’t white. But due to the fact that we have never been racist or thought of anyone any different, she only saw people as people. It’s how she still sees people. It’s how we all do. Well written and scary. Even more scary since it is reality. It is unfortunately. I live in a town where a lot of people come seeking asylum, it is one of the main entries into the country. I know there are a lot who come here just to see what benefits they can get, but far too many people just see them as a blight on the countries. It is unfortunate some don’t see them as people. I agree. It’s not the skin color or the religion or the culture which matters; its what makes us all human being inside. Living as a student I’m surrounded by people who have similar opinions to me, and so it’s not often I come across people who agree with the likes of Britain First and the EDL. It’s always a bit of a shock when I realise just how many feel that way. It is a shock, and the thing is, the EDL and Britain First are generally blinkered and don’t see everything. They hear one thing and use that, even if that is a minor part of the whole. A while ago. the EDL and BF got their pants in a tizzy because a woman was told to take down her flagpole that was flying the union flag. There were cries of “If people don’t like it they know where the door is”. When you read the whole story though, it is something completely different. She was told to take the pole down because it was somewhere she wasn’t allowed to, at a height that was restricted, and she didn’t get planning permission. It wouldn’t have mattered if she was flying the union flag, the French flag or a Moomins flag, she would still have been told to take it down.